Peanut Butter Pie - The Most Decadent, Delicious Dessert EVER! This Peanut Butter Pie is one of the most incredible desserts ever! 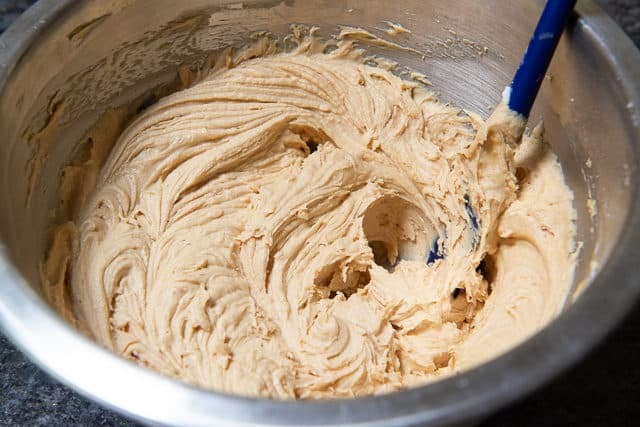 It has a creamy, luscious texture and a rich peanut butter flavor. This recipe is so good that it’s almost mean for me to post it. 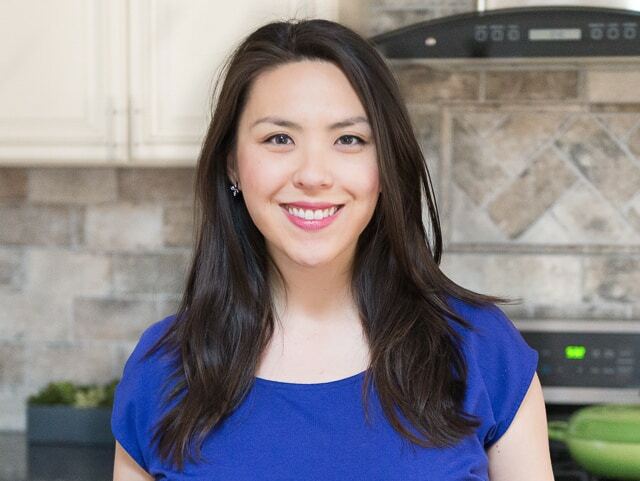 Or at least, my husband told me that I shouldn’t post this recipe for the good of my own readers, haha. 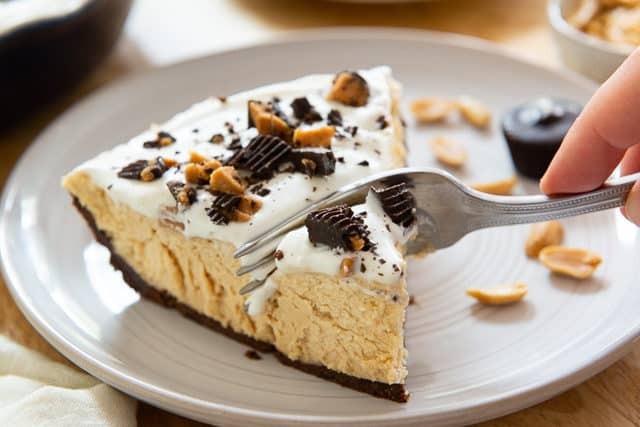 He has obviously been overruled, because while this peanut butter pie is dangerous, it’s worth every bite. 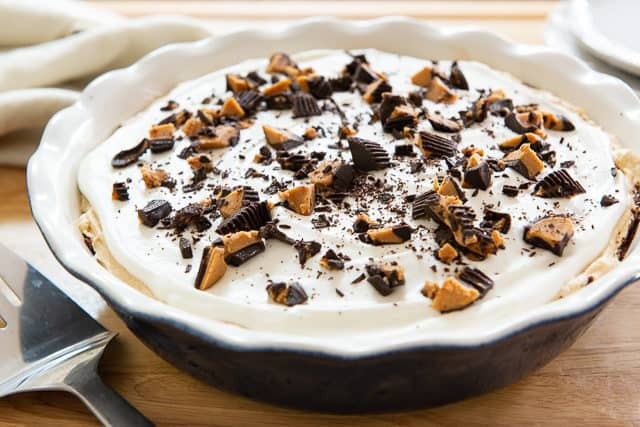 The peanut butter filling has a creamy, silky texture and a rich flavor, accented by a chocolate graham crust, a touch of pillowy whipped cream on top, and bits of chopped peanut butter cup. So many textures, so many flavors, and complete heaven. Because this pie is all about peanut butter and dairy and chocolate, I try to make this only for special occasions. It is quite indulgent, after all. It’s well-suited to football watching or game day gatherings, or even on Thanksgiving as an unconventional pie option. It’s really easy, can be made in advance, and stores beautifully in the freezer. You may also use cream cheese in place of the mascarpone, but I like the flavor of mascarpone better. Next, whip heavy cream to soft peaks. 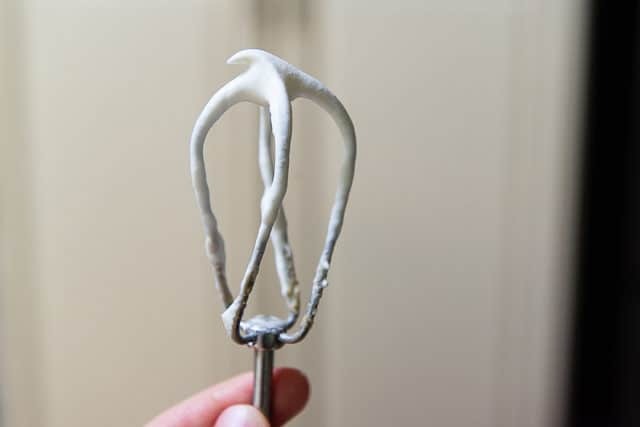 Gently fold the whipped cream into the peanut butter mixture, in batches, to lighten the texture. 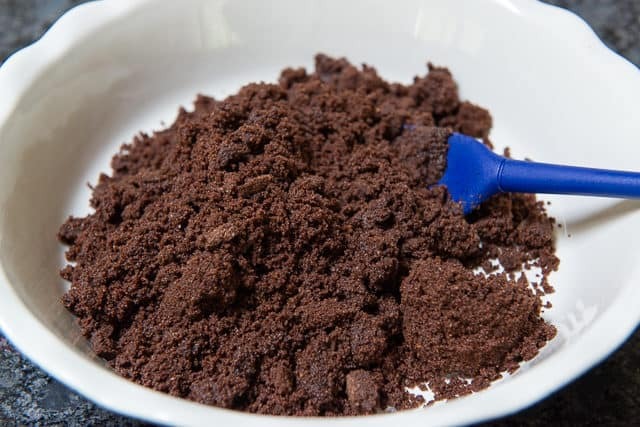 Sometimes chocolate graham crackers can be hard to find, in which case you can use regular graham crackers and add cocoa. It works just as well. Press it up the sides and bake for 10 minutes, then let it cool. This pie is best enjoyed somewhere between frozen and refrigerated. I think the perfect amount of time is to take the pie out of the freezer 10 minutes before you want to eat it. These melt-in-your-mouth Peanut Butter Cookies are also one of my favorite peanut butter desserts. Enjoy! How Long Is Peanut Butter Pie Good For? This is stored in the freezer, so it will last a good couple months. 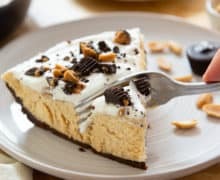 Can Peanut Butter Pie be Frozen? Yes and it should be. The fridge will keep it at too loose of a texture and it would be hard to slice. 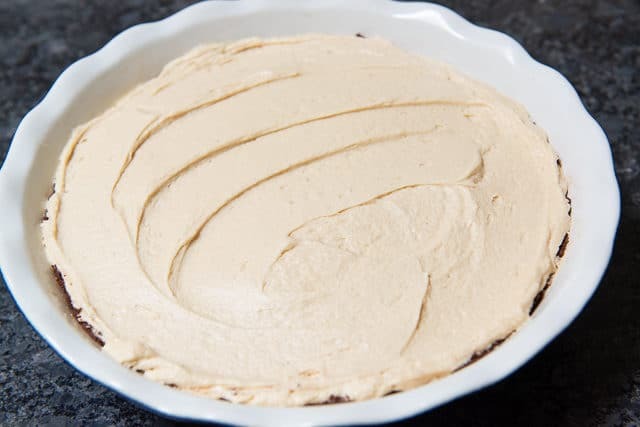 This Peanut butter Pie is made without cool whip, and I used mascarpone in place of the usual cream cheese. 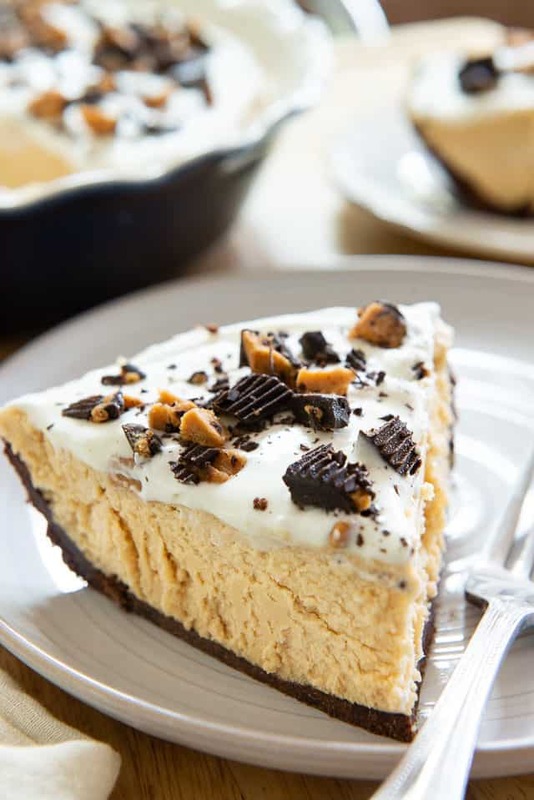 This Peanut Butter Pie has a rich flavor and texture, and stores well in the freezer. 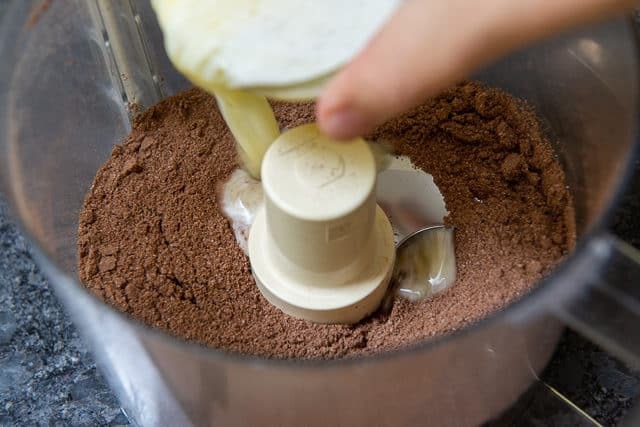 In a food processor, pulse together the graham crackers and sugar, until ground. Add the melted butter, and pulse until evenly moistened, about 10 times. Press the mixture evenly into a 9" pie plate, pushing the crust about halfway up the sides. Bake for 8-10 minutes, until it looks dry and has lots its sheen, then cool completely on a wire rack. 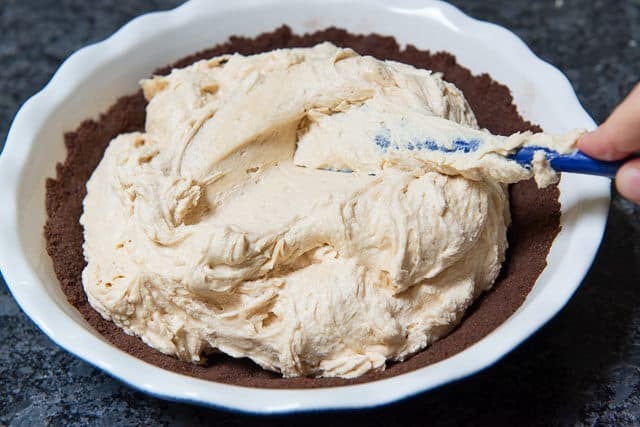 To make the filling, with a hand mixer, beat the mascarpone, peanut butter, confectioner's sugar, and vanilla extract, until fluffy and light, about 2 minutes. 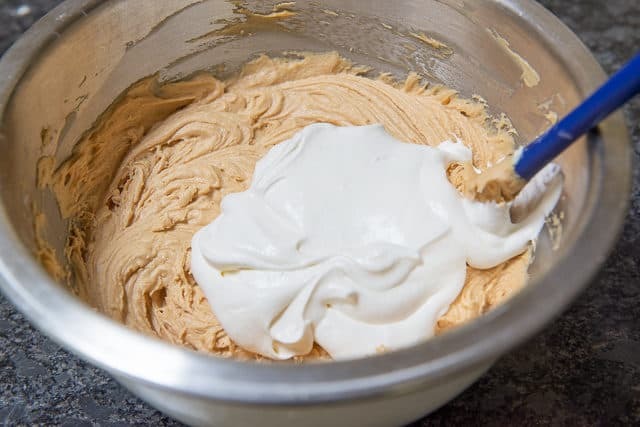 In a separate bowl, whip the cream to soft peaks, then gently fold it into the peanut butter mixture in 3 separate installments. Spoon the mixture evenly into the cooled crust, cover with plastic wrap, and freeze for 2 hours. To serve, whip the 1/2 cup cream and 1 tbsp sugar to soft peaks, and spread over the pie. Garnish with chopped peanut cups, and serve. Note: This pie is best enjoyed somewhere between frozen and refrigerated. I think the perfect amount of time is to take the pie out of the freezer 10 minutes before you want to eat it. Enjoy!!! *If you can't find chocolate graham crackers, simply sub regular graham crackers and add 3 tbsp unsweetened cocoa powder. Also, one sleeve is equivalent to 1.5 cups of graham cracker crumbs. Post updated November 2018. Originally published August 2011. I found this at the bottom of your peanut butter cups post–Being one who in a pinch eats chocolate chips mixed with a spoonful of peanut butter, I needed to make both of these ASAP! HAHA I do that sometimes too…PB and chocolate, so good. You’ll love the pie…it’s one of my favs. Finally made this today.. soo delicious and creamy!! That crust takes it to a whole new level of heavenly!! This recipe is a real keeper. Heavenly! It’s a good thing I made this for a family dinner or I would have eaten far too much of it! I did think I enjoyed it even better at closer to fridge temperature than frozen….I took it out of the freezer 10 min before serving and it was still very hard. But I used cream cheese instead of mascarpone so maybe that made a difference? Either way it was amazing!